I'm a whisk gal. I have two in my kitchen and that's saying a lot since I had to stuff whatever I could in my suitcase to bring to Brazil. Most things got left behind, my whisks did not. My favorite whisk is Mr. number seven, the silicon ball whisk. I use it for everything. I love the nonstick little balls at the end, it makes my batter so much better (sorry I had to). I've heard number five, the ici batter whisk, is the bomb. Have you ever used one like that before? It's supposedly great for delicate batters and whips up beautifully fluffy pancakes. I want one. In fact I would gladly have all of these starting with number one hanging from my kitchen ceiling. 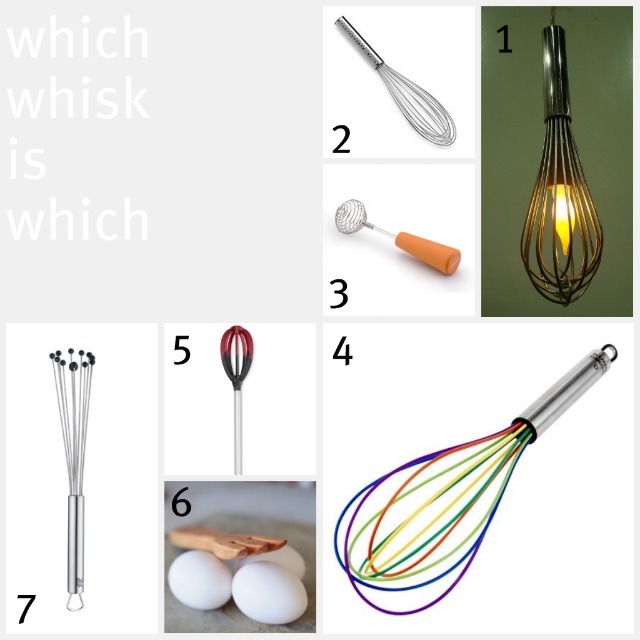 Here is a glossary of different types of whisks. Makes me wish I had one of each kind. Are you a whisk person or do you just use a wooden spoon for everything? If you're a whisk person do tell me what your favorite whisk is. I have a very old one, that's big and clunky but works like a charm. Time to buy a new one, though. I used fork when beaten eggs. All pictures are nice but picture # 1 catch my attention. I like the style.